Born at Ventnor, Ontario in January 1882, he received a BA degree from Queen’s University in 1904 then came to Manitoba and attended the Central Normal School and Brandon Normal School. 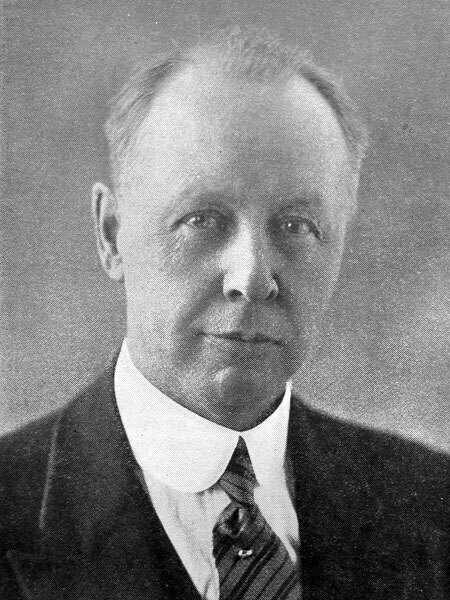 He taught school at several towns, including Lenore, Griswold (1907-1908), Virden, and Souris (1909-1910), serving at the latter as Principal of Souris Collegiate. In 1911, he was appointed a School Inspector, based at Carberry, later moving to Brandon. He was transferred to Winnipeg in 1926, overseeing schools operating north of the city until his retirement in 1945. He was married three times, first to Lola Kathleen O’Neil (1889-1921) on 3 July 1907, at Brandon. They had two children: William Stanley Dunlop and Kathleen Henderson Dunlop (1913-2013, wife of Richard McLeod Litch). After his first wife’s death, he married Jessie Adeline Berry (1876-1937, widow of Jack Berry) at Brandon, on 2 April 1923. His third marriage, on 24 July 1941, was to Madge W. Mooney (?-?). He served as President of the Inspectors Association (1922), Manitoba Educational Association (1936-1937), and Canadian Club of Winnipeg (1944). He died at Winnipeg on 6 September 1945 and was buried with his first wife in the Brandon Cemetery. “Bridegroom's father performs ceremony at Litch-Dunlop wedding on Friday evening,” Winnipeg Tribune, 3 July 1937, page 16. “Wife of Inspector J.E.S. Dunlop dies,” Winnipeg Free Press, 23 September 1937, page 18. “Dunlop - Mooney,” Winnipeg Tribune, 28 July 1941, page 5. “Mr. and Mrs. J. E. S. Dunlop,” Winnipeg Tribune, 21 August 1941, page 9. “School Inspector J. E. S. Dunlop dies,” Winnipeg Free Press, 7 September 1945, page 3. Kathleen Henderson Dunlop, Haskell Family History.